Increasingly, researchers are turning to digital tools to find and access content, and are using the web to share and organize research output in new and exciting ways – just consider Mendeley for a moment. Much research material now has a fully digital life-cycle and this new type of content calls for a new publication format. At Elsevier we have been working to meet that need via our Article of the Future (AotF) project. The format of an article hasn’t evolved much over centuries. While the move from print to PDF has changed the way in which articles are delivered, and made content easier to find, the article format has remained, by and large, unchanged. We believe there is a lot of room for improvement. For example, at one time or another many of us will have printed out a plot, then used a ruler to reconstruct the actual data points – an inefficient and inaccurate process. We know that the author has the actual data and may assume that they are willing to share it (since it is presented in a plot) – but it’s the article format that makes that sharing impossible. Our answer has been to develop an interactive plot viewer that allows readers to hover over data points and see the actual value of the data as provided by the author (see figure 1). This is still a prototype application, but we are working on deploying such an interactive plot viewer on ScienceDirect. Break away from the limitations of the traditional, ink-on-paper article format. Enable researchers to publish their work in all its dimensions, including digital content like data, code, multimedia, etc. Take advantage of what modern web technology has to offer to create an optimal and richer reading experience. There are three main directions in which we are improving the online article – presentation, content and context. You may have read about some of these in previous articles in Editors’ Update. However, new elements are being rolled out on a regular basis and 2013 has seen a number of innovations introduced. Below we highlight just some of these and outline how you can get involved. In ScienceDirect, articles now appear across three panes (see figure 2). The left-hand pane is used for browsing and navigation, the center pane is optimized for online readability, and the right-hand pane collects additional content and functionality. 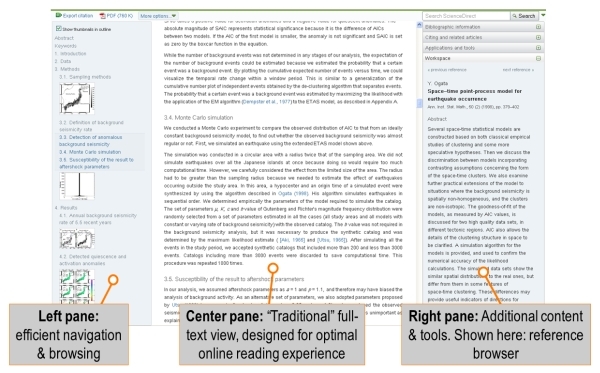 What is shown in the right-hand pane will vary per research discipline and even per individual article – influenced, for example, by the content the author has delivered. 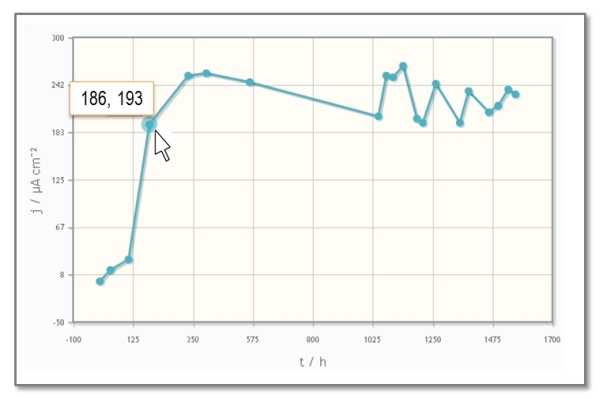 However, it also includes some generic features, for example the reference browser shown in figure 3. When you click on a reference in the main article, bibliographical information for that reference appears, including an abstract when available. This information is pinned to the right-hand pane, so that it remains in place while you read through the paper in the center pane. This example shows how small changes can make a difference – this is not a technological tour de force, yet it saves readers a lot of scrolling time. This aspect of the AotF focuses on better support for digital research output such as data, code, or multimedia, but also on better support for domain-specific data formats. One innovation we have introduced this year is the embedding of 3D visualizations in online research articles - invaluable for understanding complex structures, dynamic simulations, and research discoveries. Without interrupting the flow of reading, users can explore and interact with 3D models by zooming in, panning and rotating. They can also change various display settings, open the viewer in full screen mode and download original data files. The ultimate goal of this project is to create an online visualization infrastructure for ScienceDirect that can be accessed from any device. We are working to achieve this in partnership with Kitware SAS, our 3D visualization service provider. So far, a 3D molecular viewer and a 3D archaeological viewer are available. An author simply uploads the model as a supplementary file to the Elsevier Editorial System (EES). 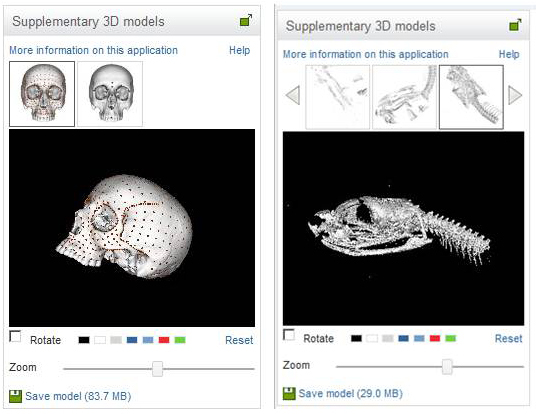 The 3D model then appears in the right-hand pane of the article on ScienceDirect. 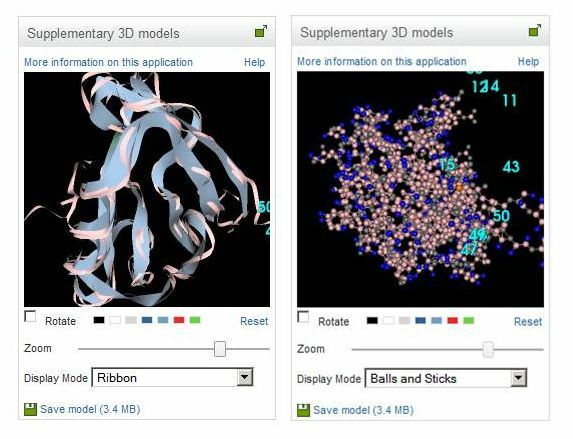 The 3D molecular viewer visualizes molecular structures and supports PDB, PSE, and MOL/MOL2 data formats. It allows the models to be explored using the two most common visualization techniques: ‘ribbons’ and ‘balls-and-sticks’, both shown in figure 4. The 3D archaeological viewer (see figure 5) visualizes models submitted in PLY and OBJ formats. The surface rendering technique is applied to display 3D data (including the texture and material properties support). The viewer was developed to support the new Elsevier journal Digital Applications in Archaeology and Cultural Heritage, which is unique in that it focuses on the application of 3D modeling to cultural heritage. The next 3D viewer – a neuroimaging module supporting 3D data in NIfTI format for selected neuroscience journals – is currently under development. Another big step for the Article of the Future project was taken in May of this year, when Elsevier announced the first Executable Papers on ScienceDirect. These papers were published as part of a Special Issue in the journal Computers & Graphics, and would not have been possible without the full support and ambassadorship of the Editor-in-Chief, Joaquim Jorge, and guest editors Michela Spagnuolo and Remco Veltkamp. What makes Executable Papers unique is that they not only capture the narrative of a traditional scholarly paper, but also the computational methodology underpinning the reported results. This gives the reader additional insights and ensures full reproducibility of key scientific findings – an ideal of scholarly communication but, with the traditional article format, something that is often not realized. The Special Issue makes use of the Collage Authoring Environment, developed by a Polish team affiliated with CYFRONET and first-prize winner of the Executable Papers Grand Challenge launched by Elsevier in 2011. Using Collage, authors can upload data and computer code and interconnect these elements to construct a ‘computational experiment’ from input to output. ScienceDirect readers can inspect code and data, and – more importantly – they can also change parameters, upload their own test data, and re-run code to really probe the paper’s computational methodology. 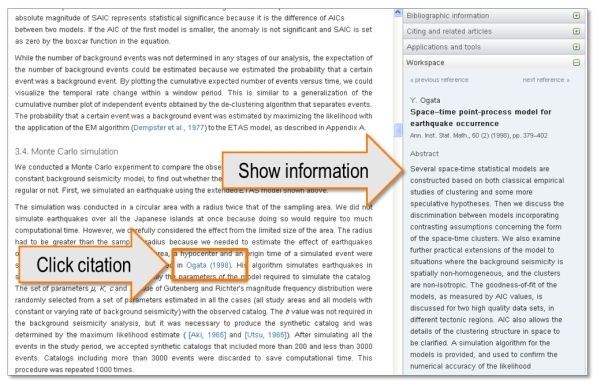 Collage also offers reviewers and editors access to the computational experiments that belong with a paper, extremely useful for the peer-review process. Another recent innovation, which is quite different from the projects discussed above, is AudioSlides. These are five-minute, webcast style presentations (combining slides with voice-over recordings) displayed next to the article on ScienceDirect. What sets these apart is that the presentations are not an integral part of the paper, but rather presentations about the article. They are created by the author and offer a unique opportunity to provide insights into the paper’s content and explain why it is of interest. This new feature has been rolled out to a wide range of journals, and we do hope that you will encourage authors to make use of it. As an editor, you can also highlight papers of interest yourself by creating an audio podcast. This might take the form of an interview with the author or it could be you sharing your opinion about the article with potential readers. There is also the option to create a podcast for a complete journal issue, which may be organized as a brief overview of all included articles. The article-related podcasts will appear in the right-hand pane of an article, while issue/volume-related podcasts will appear next to each article in the specific issue/volume. The Interactive (Google) Maps viewer, now available for more than 100 journals working with geospatial data. Authors upload their KML/KMZ files as supplementary material and the viewer upgrades a static map to an interactive one. This is integrated into the article view on ScienceDirect and readers can download underlying data. An application to visualize MATLAB figure files. 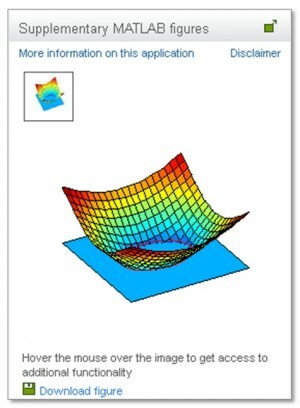 MATLAB is a general-purpose mathematical modeling tool widely used in engineering and applied sciences. With MATLAB it is possible to export plots to a MATLAB FIG format, which contains both the visualization and the underlying data. Currently available for 50+ journals. Interactive phylogenetic trees. Displayed in the center pane below the abstract, this application allows the reader to interactively explore phylogenetic trees on ScienceDirect. To support this functionality, authors of relevant articles are invited to submit their tree data in Newick and NexML formats. The Chemical compound viewer, an application that visualizes the chemical structure of key compounds in the article and links to Elsevier’s Reaxys® chemistry database*, where additional information can be accessed. Web technologies allow us to interlink the article with other sources of relevant, trusted scientific information on the web – upgrading the article from a one-way street to a roundabout. For example, Elsevier has a program to link articles with relevant data sets that reside at a data repository. One way we can do this is by inserting a banner next to an article which is only shown if a database has data sets specifically relevant to the paper. 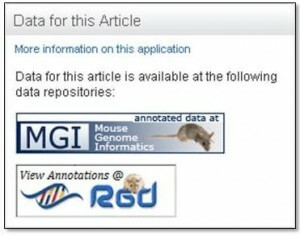 Figure 8 shows a banner pointing to two data repositories: MGI (Mouse Genome Informatics database) and RGD (Rat Genome Database). We currently collaborate with more than 30 data repositories in different domains. Taking data linking one step further, it’s also possible to build visualization tools on top of data links, for example the PubChem Compound Viewer we have developed with the National Center for Biotechnology and Information (NCBI). The application extracts relevant information from the NCBI PubChem Compound database using the PubChem CID code and compound name provided by the author. It generates a short summary, which includes the 2D chemical structure image, molecular weight, molecular formula, IUPAC name and a direct link to the full PubChem record (see figure 9). 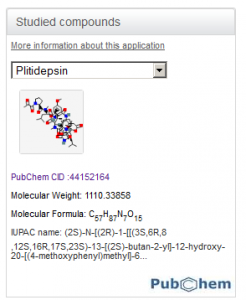 The PubChem Compound Viewer appears in the right-hand pane of the article on ScienceDirect. Do you have an idea for a content innovation to enhance online articles in your discipline? If so, please do let your Publisher know. When you receive a new paper, please take a few moments to think about whether it can benefit from some of these content innovations. If so, we would encourage you to ask the author for the supplementary data required. Encourage your authors to use AudioSlides to talk about their paper and attract the attention it deserves. Create your own editor podcast to highlight articles that deserve special attention. To find out more, please email Elena Zudilova-Seinstra at e.zudilova-seinstra@elsevier.com. Connecting Scientific Articles with Research Data: New Directions in Online Scholarly Publishing, IJ J Aalbersberg et al., Proceedings of the 1st ICSU World Data Systems Conference, 2011. IJsbrand Jan Aalbersberg et al., “Elsevier's Article of the Future enhancing the user experience and integrating data through applications”, UKSG Insights 25 (1), March 2012, DOI: 10.1629/2048-7754.25.1.33. * Reaxys®, the Reaxys® and ReactionFlash™ trademarks are owned and protected by Reed Elsevier Properties SA. All rights reserved. 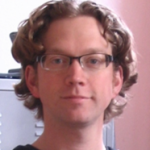 Hylke is responsible for a range of projects to enhance the online article format. Part of Elsevier’s Article of the Future program, this includes improved online presentation, better support and visualization of digital content, and contextualization of the article by linking with data repositories and other sources of trusted scientific content on the web. Before joining Elsevier in 2010, Hylke received a PhD in Theoretical Astrophysics from the University of Amsterdam and served as a postdoctoral research associate at the Université Libre de Bruxelles. He is based in Amsterdam. Elena has been working on the Article of the Future project since joining Elsevier in 2010 as a Senior User Experience Specialist for the User Centered Design group. She holds a PhD in Computer Science and an MSc degree in Technical Engineering from the St Petersburg State Technical University. Before joining Elsevier, she worked at the University of Amsterdam, SARA Computing and Networking Services and Corning Inc.